Uncategorized Archives - Page 2 of 8 - Western Fence Co.
May 18, 2017 /in Uncategorized /by Western Fence Co.
Get the most out of your outdoor space this summer by transforming it. After getting the much desired privacy by adding a fence to enclose your yard, make it even more inviting by using some of the ideas in this article. 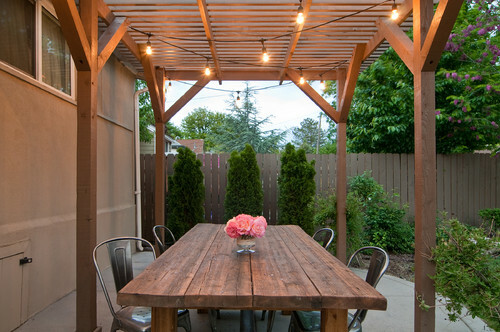 From lighting to furniture, you can easily create an outdoor living space that is inexpensive and eco-friendly with recycled materials. 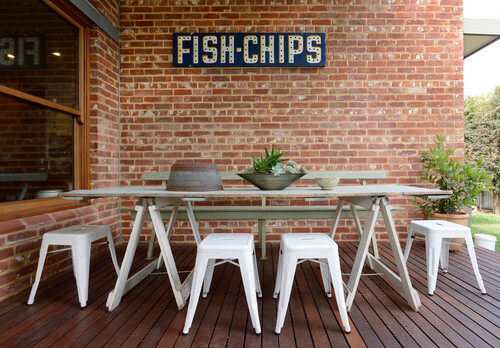 Been gazing out at your backyard, wishing you could spruce up your hangout space? You don’t need to spend a lot to make a big difference in the way your outdoor rooms look and feel; you can whip up furnishings and decor, hunt for vintage bargains and make smart choices about new purchases. Here are 10 ideas for updating your space on a dime. 1. Hang a vintage sign. One big, statement-making piece is enough to bring an outdoor room into focus. Hunt through the stalls at local flea markets or search online to find a sign that speaks to you. Spending a little more than you’re used to on this one item can actually be worth it, because it will make everything around it look instantly cooler. 2. Rig up a sawhorse table. Need a table fast? Head to the hardware store. A pair of sturdy sawhorses topped with a door slab makes a quick dining table that can be taken down and stored when not in use. Paint the sawhorses and tabletop, or simply cover the whole thing with a giant tablecloth. 3. 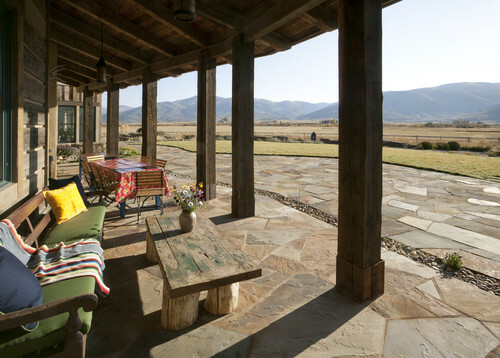 Cover an imperfect patio with a colorful rug. Cheap and cheerful plastic outdoor rugs are perfect for covering up less-than-perfect brickwork or cracked cement. 4. 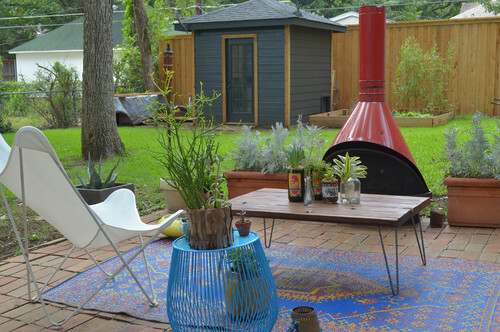 Hunt down a used outdoor fireplace. These homeowners found the cool outdoor fireplace shown here for $100 on Craigslist. Keep an eye out – you might get lucky! Also try searching for used fire bowls, patio furniture and big planters. You won’t know what’s out there unless you look. 5. Make some furniture with salvaged pallets. 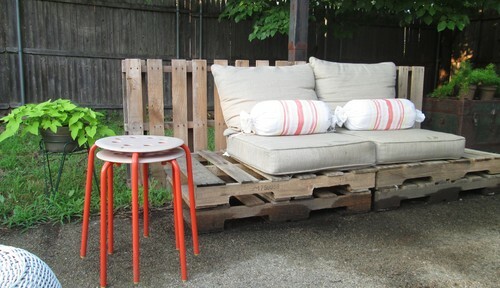 Stacked wood pallets can make an almost-instant outdoor bench, love seat or daybed. You can buy salvaged pallets, find them on Craigslist or see if local stores have any they want to get rid of. Paint them first if you want, then top them with thick cushions and toss pillows. 6. 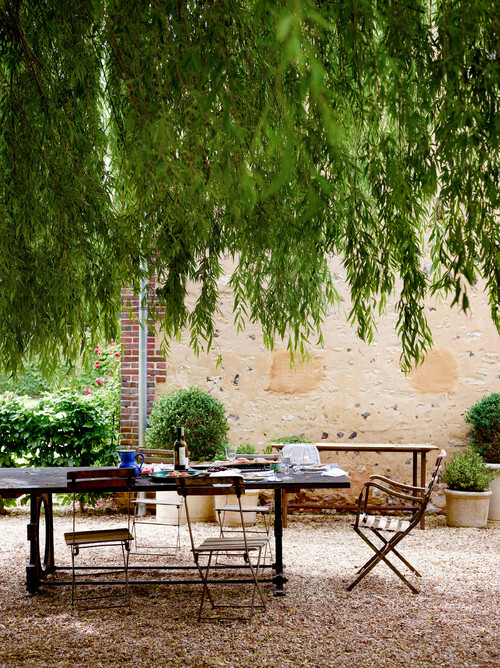 Hang outdoor curtains. Look beyond the catalogs to find ideas for whipping up your own outdoor curtains on a budget – painter’s drop cloths, cute shower curtains and tablecloths can all work. If you don’t want to sew, purchase a grommet-making kit and pop in grommets along the top side of your fabric, then simply hang it from any curtain rod. 7. 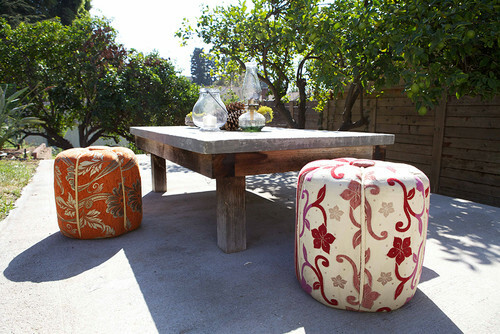 Use a coffee table and poufs in your backyard hangout. Poufs on sale can be quite a bit cheaper than dining chairs, and they make for a fun twist when entertaining. Less formal than a dining table and chairs, and more convivial than an outdoor living room, the intimate setup here encourages chatting, snacking and sipping. 8. Choose gravel instead of stone. Gravel costs far less to install than pavers or other hardscaping, and can look just as chic. For a beach-inspired twist, try spreading crushed oyster shells instead of gravel – if you live on the coast, it may be cheaper than gravel, too. 9. Make a table from tree stumps. Four solid trunk sections make a sturdy table base when trimmed to the same height. Set an old wooden door or scrap-wood slab on top, no nailing required. 10. Never underestimate the power of café lights. A strand or two of outdoor café lights (the kind with large bulbs and exposed filaments) is a can’t-miss way to bring life to an outdoor seating area. If you do not have access to outlets, hang solar-powered string lights instead. April 27, 2017 /in Uncategorized /by Western Fence Co.
People that have pets are the most common to install electric fences on their property to keep their pet close to home without physical fences blocking their lawn. There are advantages and disadvantages to the different kinds of electric fences. This article from DoItYourself.com points out what you should know before taking the plunge of buying and installing an electric fence. When you are considering purchasing an electric fence, there are two main decisions to keep in mind: what type of electric fence you want and what amperage and voltage to use. Electric fences will deliver a jolt of electricity when touched or crossed. The amperage of the electric fence determines the strength and severity of the shock that it will generate. When considering purchasing one of these electric devices, there are several things to keep in mind. Warning: Double-check product standards and safety guidelines regarding your animal type before making your fence purchase. Remember not to use more voltage or amperage than required, as this can hurt both animals and humans. Many states, cities, and counties have laws related to maximum voltage that you should research before making your purchase. There are three main categories of electric fences. The first type is the standard, above-ground electric fence. This type of fence will typically consist of posts and wire. Anyone that touches the wire of this fence will receive an electric shock. The second type of electrical fence is the underground fence. This type consists of electrical wire buried in a small trench surrounding the perimeter area. For this type of fence to deliver a shock, the animal must wear a receiver in a collar. The third type is called a wireless fence, and it has a transmitter that sends a signal outward, creating a circular boundary. For this type to work, the animal must also wear a receiver in a collar. With all electric fences, the intended outcome is to deliver a shock to startle the animal without causing any harm. If the fence is created to keep people out, usually a warning sign on the fence is enough to stop someone from attempting to cross it. The amperage required of your electric fence depends on what the fence is keeping in or out of your property. If the amperage is too low, the electric fence will not be effective, and if the amperage is too high, the shock could be harmful to the animal or human that is shocked. You will typically see voltage amounts used as well as amperage. Voltage is the power of flow, while amperage is the current, or the rate of flow. Most often, these two measurements are seen together. Even though voltages are high in electric fences, current (amps) is very low and is generally intermittent or pulsed. Amps are the dangerous part of an electrical charge. Some studies have concluded that a minimum of 2,000 volts is required to create an effective fence. The typical voltage on an electric fence when keeping cattle is 3,000 volts. This is enough voltage to deliver a startling shock. When considering this kind of fence, keep the reason for using it in mind. The type and size of animal intended for the fence will help determine what type of fence is best and what voltage and amperage the fence will require. April 26, 2017 /in Uncategorized /by Western Fence Co.
Chain link fences can typically withstand a lot of wear and tear. However, with time, the material can thin out and tear apart. If you have noticed some damage like this on your chain link fence you might be able to repair the sections without having to replace your fence completely. Try following the guide below from DoItYourself.com. You may need to conduct repairs to a chain link fence for a number of reasons: a tree fell on it during a storm, it was cut by trespassers, or it stretched and popped out of place under the weight of a snowplow. Whatever the cause, it’s an easy repair with some tools, instructions, and a little help. Inspect along both sides of the fence in places where there is obvious damage. Branch out from there to check for loose posts, gates, and top rails as well so you’re aware of everything that needs attention. Make note of these areas on a rough diagram to keep track of them all. Take measurements between intact fence posts to learn the standard length of fence railing for your existing fence. Then, count the posts that run throughout the damaged area to calculate the length of new fence railing you will need. Measure the thickness of the fence railing as well so you can buy the same size you currently have in your fence, either 1 3/8-inch or 5/8-inch. If the fence posts or gate have been damaged, take one of each with you to get replacements in the correct size. Assess if you will need new chain link, too. Some of the material will be able to be bent and refitted, but if the metal is badly bent or cut, it will need replacement. Buy all necessary parts and the hardware to attach everything. Start by cutting the wire ties that hold the chain link to the rail. Then, place the new fence rail on top of the old one and mark where you’re going to cut on the damaged one. Mark the other end of the new rail where it will meet a joint. Set the new rail aside and cut the damaged one into 24-inch pieces with a hacksaw. Slide the very end off of the joint and set all these aside for later disposal. Remove the fence railing all the way to any damaged posts. Clip any ties that are still intact and slide the old posts out of position. Install your new ones using the same post holes. Remove the nearest end post cap, brace bands, and the vertical tension bands from one end of the fence. Slide the new fence railing into the rail cap slot, and along to where it’s needed. Attach the end of this fence railing to the end post rail cap, and reconnect brace and tension bands. While you hold the closest post, ask someone to aid you in putting the undamaged chain link back over the new post. Insert a soft nylon cord through chain links to help pull. Look at an intact fence section to check that caps and bands are in the correct position before tightening the connecting bolts fastening the chain link to each post. Note that the vertical tension bar, woven through the chain link parallel to the fence post, is correctly aligned. Reconnect the horizontal tension bands to the vertical tension bar, and the vertical brace bands to the fence railing. In the event some of your existing fencing was irreparable, it’s at this time that you will want to clip away the damaged chain link and add in new material. Make sure to wear work gloves to protect your hands from sharp wires. For large areas of damage, it will be easiest to cut the fencing at the surrounding poles. This will ensure that the existing fencing is held securely while you’re weaving in the new material. If you have just a small hole, this will mean buying a lot of extra material, so you can clip around the damage and just have a helper hold it. Clip and bend two vertical lengths of wire from the old fence to use in attaching the new fencing. Then, on one end, use one of these pieces to weave the ends of the two chain link sections together. On the opposite side, use the come-a-long tool to stretch the fencing tight. Cut your new material to the length you need to fill the space and use the second vertical length of metal to weave these ends together as well. Keep your chain link fence well maintained. Check it in spring after heavy snow and after severe storms where trees have fallen. Even if the trees fell far from your house or garage, damage to the fence at any point will reduce the stability of the entire fixture. March 31, 2017 /in Uncategorized /by Western Fence Co.
Wrought iron used to be a very popular material to use for fences. However, as most metals do with time, it can rust. If you have a wrought iron fence on your property and want to restore it back to its original beauty you can roll up your sleeves and follow this guide. It will take a little elbow grease, but it is worth it to keep your fence looking great. A wrought iron fence is meant to last for years with proper care, but if you aren’t careful, your fence can suffer from its worst enemy: rust. Rust can severely damage wrought iron and completely ruin its appearance. Fortunately, you can restore this metal to its original look and also protect it from future damage with the right steps and tools. Use a paint scraper to remove any loose or peeling paint and a wire brush to scrub away loose rust and old paint. If the rust is heavy, use a drill with a wire wheel instead. Make sure to get into tight areas and joints where rust is most likely to be found. Follow up with a coarse-grit sandpaper over the entire fence, concentrating on the affected areas. Some deep rust may require sanding all the way down to the metal, so you may want to use a drill with a sanding wheel to save yourself some pain. When you can’t see anymore rust, go over the fence again with a medium-grit to take care of anything that remains and smooth the surface. Finally, buff the entire fence with fine steel wool in a circular motion to smooth and prepare it for painting. Rinse with clear water to get rid of dust that remains. The key to restoring a wrought iron fence is to remove all the rust, not just the loose stuff. Any left behind will continue to spread and ruin the metal even after you refinish it. Although you may not see any, there can be some tiny particles remaining. Mix a commercial rust neutralizer per package instructions in a bucket. Dip the wire brush into it and scrub the entire fence in a circular motion. For those who prefer not to use chemicals, you can use a solution of half lemon juice and half white vinegar to neutralize any remaining particles. Wipe down the entire fence with the solution and allow it to dry for one hour. Wash off with soapy water and let the surface dry completely. Paint the entire surface of the fence with an even coat of rust-inhibiting primer for metal and allow it to dry at least four hours. Apply two fairly thick coats of rust-resistant paint over the primer using a medium-bristled paint brush. Use smooth, even strokes to cover all areas, and allow the paint to dry completely between coats. Now that the rust has been taken care of and the fence is repaired, it is important to perform regular maintenance to keep it looking great. Wash your wrought iron fence with soapy water twice a year, and oil latches and springs with mineral oil. Also use steel wool to buff any scratches or beginning signs of rust and neutralize with lemon juice and vinegar again. Touch up scratched areas with matching rust-resistant paint after neutralizing. March 29, 2017 /in Uncategorized /by Western Fence Co.
As with any structure exposed to the elements, decks and fences should be inspected for rot, rust and rickety supports. Far too many homeowners never take this simple step. As a result, the International Association of Certified Home Inspectors estimates that of the 45 million existing decks in North America, only 40% are completely safe. Walk your fences and decks once a year or so to look for signs of decay or structural failure, and schedule maintenance accordingly. You can perform this inspection at any time, but Ive found the best time of year is normally spring. Spring is when any snows have melted off, but before new plant growth has risen up, giving an excellent view of fence and deck supports that might otherwise be obscured. Spring is also a good time to check decks for structural issues, as most decks fail during the summer, when crowds gather on them to enjoy the weather. A deck thats twelve inches off the ground has very different support and safety concerns than one thats twelve feet overhead, but the basic issues to watch for are the same. Youre primarily looking for signs of rot, and any structural shortcomings. Using a screwdriver or awl, probe the decking material. Wood decks should feel solid when tapped, and splinter when gouged. Rotten wood will easily give way to a probing, and fibers will pull loose without splintering. Keep an eye for holes or small piles of sawdust, which may indicate insect activity. Composite deck materials are resistant to rot or insect activity, but should still be looked over for signs of damage, such as warping or bowing. Damaged structural materials will need to be patched or replaced, depending on how widespread the damage is. If you do find signs of rot, dont stop your inspection there. Decks are designed to be able to withstand weather, and they can take getting wet. However, they are not able to be consistently wet over a long time. Look for water sources that dont allow deck materials to dry out, such as sprinklers, improper grading, or downspouts that keep the decks wet. On decks, proper flashing is essential to shed water off of wood surfaces and to prevent rot. If the wood surface being protected is pressure-treated, check to see if the flashing is aluminum. Aluminum corrodes when placed in contact with pressure treated wood, so flashing will degrade over time. The methodology behind deck structures varies according to the deck material, type of connection to the home, size of the deck, and local ordinances. There are enough variables in that equation that we cant cover the entire topic in this article, but even a casual inspection can be helpful to identify trouble spots before they become major issues. As you look over your deck, give the structure a shake. Support posts should look and feel solid. If you sense a wobble when you shake them, or if it looks as if a footing is coming out of contact with the ground, then bring in a pro ASAP. 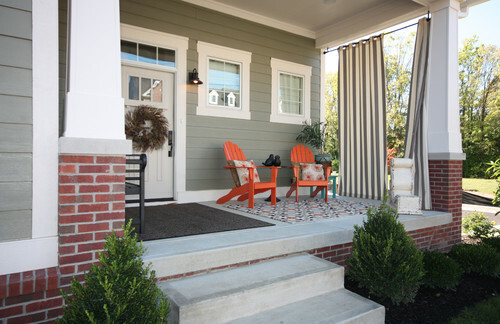 Look for any materials in the deck structure that arent designed for exterior use. For example, all fasteners on your deck should be corrosion-resistant. (If you see rust stains around fasteners, take this as a warning sign.) In addition, any wooden posts in contact with soil should be pressure-treated AND rated for ground contact. Deck hand rails should be about 3 high, and pass the 4 ball testa 4 toy ball should not be able to fit between the railings. (In this test, the 4 ball is a stand-in for a toddlers head.) Your local code requirements may have different requirements for these measurements; if so, follow their guidelines to be sure youre in compliance. To check the condition of the decks surface, spray it with water. Whether its painted, stained, or composite, the water should bead on the surface, rather than soaking into the material. Lastly, a note about hot tubs. Hot tubs are a popular feature, but unfortunately, many hot tubs are added after the deck construction, and the decks they sit on are not designed to hold their weight. A gallon of water weighs just over eight pounds, so a hot tub holding a couple hundred gallons of water, plus half-dozen people, can easily top the scales at over a ton. Thats like parking a compact car on deck. If you have any doubts about whether your deck can hold that kind of weight, bring in a pro to do a thorough analysis. Fence inspections are a little easier to conduct than deck inspections. Walk the fence line with a screwdriver or awl (I like to use a multi-tool for this), as well as a hammer and a spray bottle. Look over the fasteners to make sure they are securely seated. If you see any popped nails, now is a good time to give them a tap back into place. If the nail is still loose, try a different angle, longer nail, or different fastener location. As you walk the fence, reach out and give it a gentle shake from time to time. If any sections feel weak, try to find out if its a fastener issue, or something else. Give the boards a poke with the screwdriver or awl, checking to make sure the material is firm. Examine the fence posts during your walk, as well. Inspect the base of the posts for signs of rot or decay. The most important aspect of fence posts is that they are seated far enough in-ground to be below the frost line for your climate. Look for any posts that are starting to heave up out of the ground. If you see this happening, chances are that those posts will need to be replaced and installed properly. If you see any excessive moss or mildew growth, look for the cause. You may find a simple solution, or it may be something you cant modifysuch as a shady run along your neighbors home. Clean off the growth, and consider touching up any stain or paint as needed. Speaking of stain, the best way to check whether the stain on your wood fence needs a touch-up is to spritz it with water from the spray bottle. The spray should sit on the surface in beads. If it soaks into the wood, its time to refresh the stain. Ive mostly been talking about wood fences so far, but the same techniques apply to metal or composite fencing. Any metal fencing material is designed to withstand the elements, but damage like scrapes or dings can leave them vulnerable. Rust in its early stages can be cleaned off and the fencing can be re-treated with a protective coating. If the fence has lost its structural strength, its time to replace the affected section. A special note: Pool Fences are a separate creature, with concerns beyond simple physical condition. Local requirements vary widely, so youll have to check with your local regulatory agency in order to be sure that your pool fence meets all requirements. Common problem areas include height, railing gaps, gate swing, and latching mechanism. Hopefully, your decks and fences pass your inspection with flying colors. Take care of any maintenance as needed, and you can look forward to another year of enjoying your yard! February 25, 2017 /in Uncategorized /by Western Fence Co. Maintenance on any kind of fence is important if you want it to last a long time. If you have a picket fence there are things you can do, as pointed out in the article below, that will keep it looking great and doing its job for as long as possible. Check out the tips below for a simple DIY project. During the regular maintenance check on the picket fence, examine thoroughly especially on the fences bottom areas. These are the areas that are strongly prone to damage and decay because they are in contact with the ground. If signs of decay or damage are seen, those areas must be immediately cleaned and repaired. February 23, 2017 /in Uncategorized /by Western Fence Co. If you choose to have an automatic gate installed on your property you have to think about entry accessories and the kind you want. There are different types of gate openers, and with advancing technology, there are even ways to open gates with your phone. Learn about the different gate openers in the article below and decide what would work best for you. Electronic gate openers are a common convenience in gated households. With the help of electric technology and hydraulics an electric gate opener is a luxury thing to have. Nowadays there are various types of electronic gate openers and can also be found with solar power energy. As mentioned before at this day and age there are a lot of models and complex technologies you can choose from. Some examples of which are motion sensors, light sensor, infrared, bump sensor, remote, keypad and even using your own mobile phone to open your garage or gate. In this article we will focus on two main types of open devices, a remote and a keypad. This is the most traditional and most common electronic gate opener device used. Obviously with the advancement of technology, remotes have come a long way and improved a lot. Still very much in use, are the push button remote controllers, that is, the battery operated type where there is only two buttons, or in some cases, even one in some cases, being the open and close button. The latter are the most common of remote electronic gate openers. One type of remote can either work on radio frequencies or on Bluetooth. Today the majority of remotes work on Bluetooth, especially if they dont need an extensive amount of distance but require a rapid clear response. Another method is infrared. Infrared technology is quiet cheap to build and can last a long time. The down side of infrared technology is that you have to point the remote (which is the transmitter) directly or approximately in line with the receiver which is normally found at the bottom or at the side of the automatic gate. Todays remote transmitters are very much secure because they have a strict algorithmic procedure of radio or Bluetooth frequency, so there shouldnt be any fear regarding security. But that being said, it is always advisable to ask the person you bought it from to ensure peace of mind. An alternative way to open your electric gate or door is by making use of a keypad. When selecting a keypad controlled electronic gate opener you have to keep in mind what type of motor you have installed on your gate or garage door. A keypad is very secure because it uses a digit password, normally from 3 to 6 digits, to open the gate. It can easily be changed from time to time for more security and there is no risk of loosing your gate opener and risk end up being unable to enter your own home. The more sophisticated and expensive the equipment is, the more secure it will be since it can easily be connected to an alarm. As you can see there are advantages and disadvantages to whatever technology you choose, but remember that you have to select the most appropriate system for your lifestyle. A keypad is ideal when you need to go out of the house but dont want to carry a key.